Having heard over the summer about the IAAF Centenary Historic Exhibition at Barcelona, which would celebrate '100 Years of Athletics Excellence' over a 6-week period in October/November courtesy of the largest collection of athletics memorabilia ever assembled, a trip to the beautiful Spanish city was hastily organised. The exhibition was put together in a section of the Olympic & Sports Museum and certainly didn't disappoint. 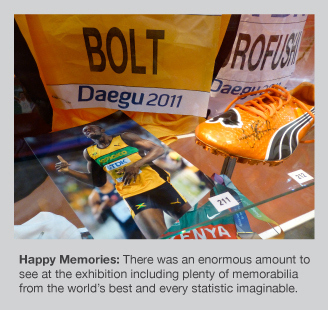 In addition to what seemed like just about every athletics statistic and record on the planet, there was a large amount of memorabilia from legends of the sport including the likes of Haile Gebrselassie, Usain Bolt, Jan Zelezny and Sebastian Coe. When viewing the wide range of major medals on show, it became increasingly evident that there have been seem absolutely hideous designs over the years and also a fair share of simply stunning gongs. The Sydney medals from their 2000 Olympic Games are a (literally) shining example of how to get it right with a classic theme throughout and an overall feel of real quality. The exhibition was cleverly conceived to flow around an eight-land section of track that took you through different eras in the history of athletics. Considering the relatively small size of the room used, the sheer volume of articles and information crammed in was nothing short of remarkable. The two and a half hours we spent there was not nearly enough to take in the finer detail of all the exhibits but the museum thought it would be sensible to close at 2.30pm on a Sunday, hence our enforced departure - maybe longer opening hours might have been advisable. All in all, however, it was an extremely fitting tribute to the achievements of athletics across the world over the past 100 years. Many congratulations to all of those that made it possible.